An item reported that the original projected displacement of the Russian cruiser Askold was increased from 6.500 to 7.962 tons. (1) The increase was used not for fitting her out with an armour belt but for enlarging the coal bunker capacity. The decision for this choice was made while she was to be used in the Far East and needed a sufficient range just like new to be built warships. For example was the coal bunker capacity of the Peresvjet as newest ship and comparable qua size with the British HMS Renown considerable larger as earlier ships. 1. Protected cruiser. 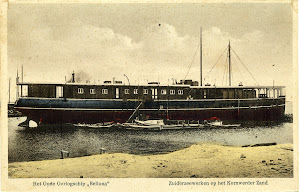 Laid down by Germaniawerft, Kiel, Germany on 8 June 1899, launched on 2 March 1900, commissioned on 25 January 1902 and broken up in 1922.